Feachtas is an Irish language youth organisation, dedicated to getting young people to socialise through the Irish language. 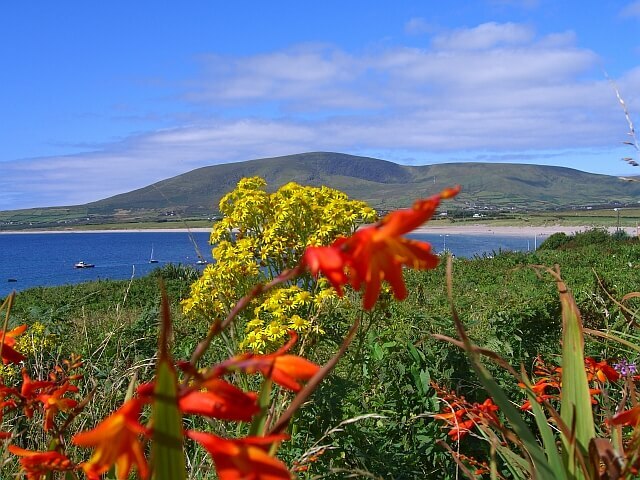 With whom does the future of the Irish language rest? The young people in Ireland. If you were to look long-term at ways to help the Irish language, on whom would you spend money? The young people in Ireland. I’m proud to say that Bitesize Irish, from part of our membership revenues, that we have donated €500 to an organisation for the Irish language with youth, Feachtas. (Wondering how to pronounce that? It’s something like /Fakh-toss/). The English language is so embedded in Irish society that it’s immensely difficult to get Irish kids to speak the Irish language between each other. I attended Irish language schools for thirteen years. These schools offered schooling immersed in the Irish language, but never succeeded to get us kids to speak together through the Irish language when not supervised. If everyone is speaking English, then it’s weird for any of the kids to switch to the Irish language. Anything to normalise the Irish language with kids is hugely valuable for the future of this language. At Bitesize Irish, we spent a long time picking and choosing a suitable charitable organisation to help. Bitesize Irish members trust us to help them learn to speak the Irish language, so it was only right to look at where to use part of those revenues to help boost the Irish language, rather than for monetary profit. 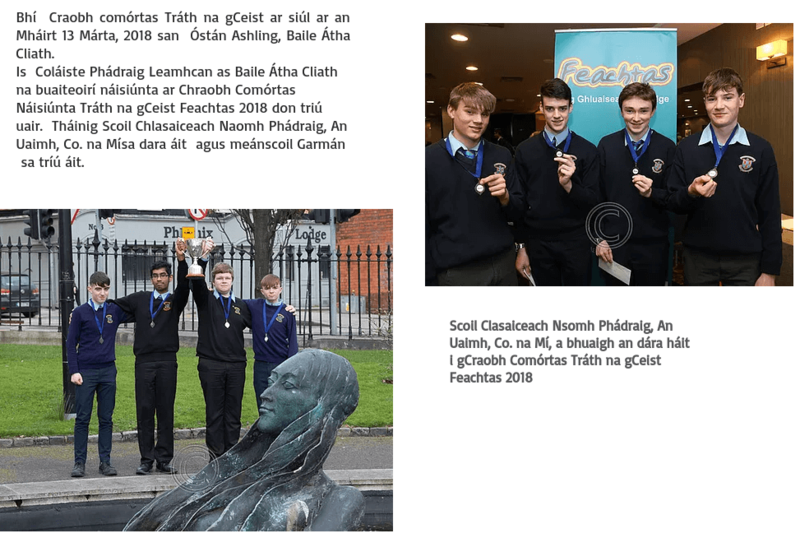 Feachtas runs a table quiz competition in Irish schools, through the Irish language. Feachtas runs an annual table quiz competition through schools. It culminates in a large event for the final round. This is a good approach, since it runs within the structure of schools, so gets the support of schools. 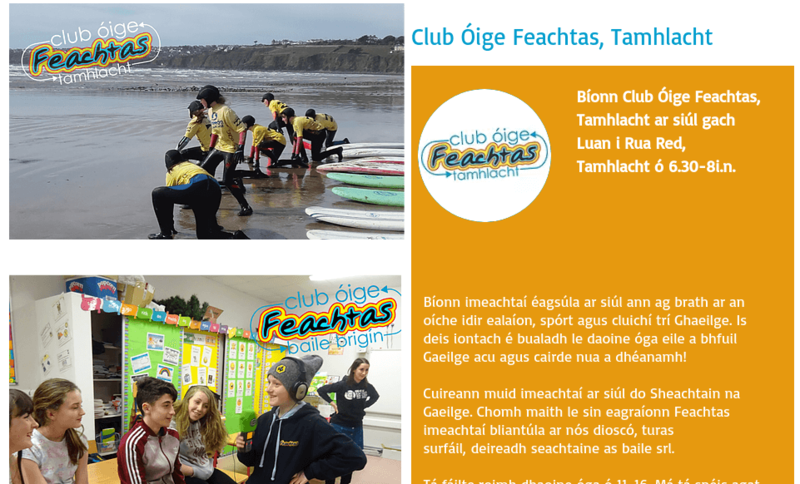 Feachtas helps establish and run Irish language youth clubs in Dublin, Ireland. Feachtas helps establish and run urban voluntary youth groups in Dublin. The future of the Irish language is urban, in our opinion, and without a doubt the future of the language is with young people in Ireland. Youth clubs mean that kids can have a bit of fun after school, enjoy themselves, with the Irish language being part of that fabric. Thank you to Feachtas: to the kids who take part, to the people working and volunteering as part of Feachtas. To Loretta for helping us through this donation, as it takes time. We hope this €500 donation will be just a small boost in your activities. Thank you to those who have signed up to Bitesize Irish: your efforts in learning the Irish language have a greater effect than you might realise. In this network world, any time you share your Irish language learning journey with others, you’re having a positive effect. Now part of the revenues from your membership have been used to give a boost to those active with the Irish language in Ireland. A Happy Irish New Year!